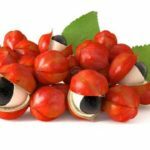 Guarana is a South American fruit that looks like suspiciously like an eyeball. In 2002, researchers studied whether a mixture of guarana) could help people lose weight. The researchers found that the mixture resulted in “significant” weight loss after 45 days.